El Prado Museum is about 5 km from Barradas, and we usually walk places, so we all gathered and set out just at 3:00. The museum is open every night until 8 pm. The directors decided to give us the option to either write a paper about El Prado or to attend a discussion on Tuesday afternoon. We are required to write a short report on each of the trips and activities that we do as a group that are part of the official program. But the professors noticed that on other trips, some of the students were just going on the Internet and copying information about the places they visited instead of doing their own analysis, so this is why they decided to offer a discussion as an option. 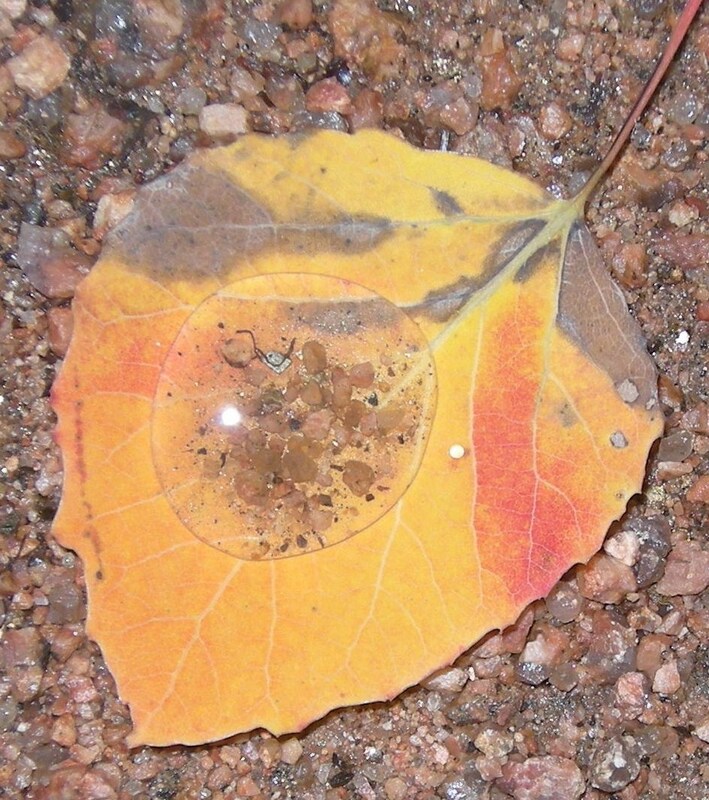 It was fine with me – I prefer the discussion rather than writing a paper in Spanish. The Prado contains the most extensive collection of Spanish paintings as well as many other European masters up until about 1900. (Most of the more modern art has been moved to the newer Reina Sofia Museum a short distance away, which is Madrid’s modern art museum). I remembered some of the more famous canvases from my last visit 35 years ago, some of which I’d even bought reproductions of and framed. However, it was great to revisit these and other masterpieces with a more sophisticated and knowledgeable eye. 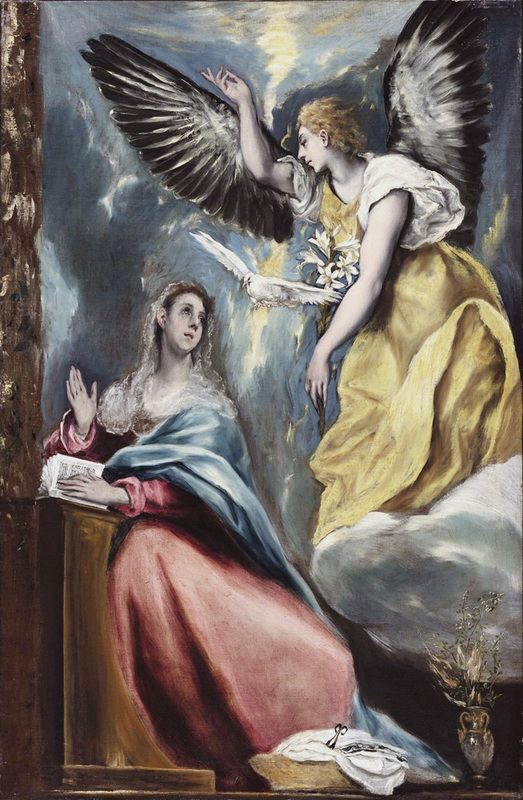 Three of the most famous Spanish painters whose paintings we spent a lot of time looking at were Velazquez, El Greco and Goya. I also insisted we go to the gallery to see the paintings by the 15th century Dutch painter, Bosch, whose unusual works influenced modern surrealists such as Salvador Dali. (More on him after we go to Reina Sofia). Velazquez: My favorites were La fragua de Vulcano (Vulcan´s Forge), painted in 1630, Los borrachos (The Drinkers) 1628-1629, La Adoracion de los Reyes Magos (Adoration of the Magi 1619 and the most famous of all, Las meninas painted in 1656. Velazquez was a realist painter who painted many religious themes but in settings of normal life, such as The Vulcan’s Forge. 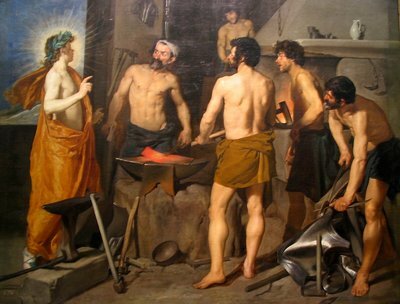 The beauty in this painting is in the figures of the half-naked blacksmith workers and the expressions on their faces. Same with Los Borrachos. The faces of the Spanish people are evident in each of these paintings. 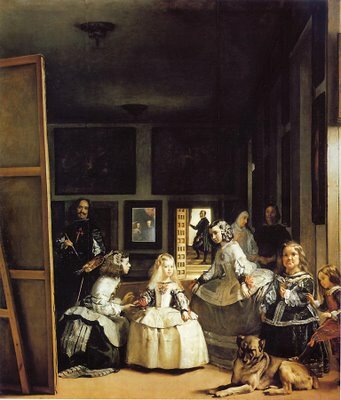 Las meninas, Velazquez’s most famous painting. Infanta Margarita with her ¨”damas de honor” (the meninas of the title), a dwarf woman and a jester with his foot on a dog in the foreground. The Infanta has a very natural facial expression and her blonde hair is very realistic and relatively unadorned. Her parents, King Philip IV and Mariana of Austria are reflected in a mirror, as observers of the scene. Solicitor Jose Nieto is in the background, in the hallway, and the painter himself is painting an unseen canvas, his palette in hand. (His studio was in the palace in Madrid where the royal family lived). Velazquez in this painting constructs a discussion about the Spanish monarchy, as well as his personal and artistic dignity. beautiful painting of Mary, her face that of the young girl she was, in awe of the angel Gabriel who has come to visit her as she sat with a book and sewing basket. I also really liked Cristo con la Cruz a Cuestas (Christ with Cross on his Back) because of the expression of the eyes looking toward heaven, accented by brightening the light reaching his eyes from below. The physical pain he feels contrasts with his serene expression. 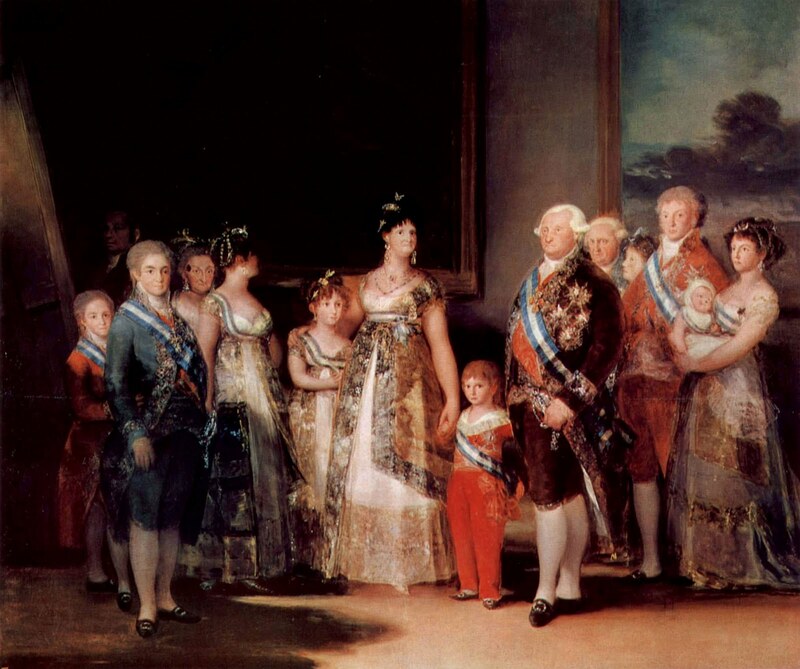 Francisco Goya painted La familia de Carlos IV in 1801.
as haughty, self-confident, in control. The detail in her dress and jewelry is so realistic that I could swear I saw her earrings move, not just once but twice!!!! Goya painted himself in the shadow of the background. I also really appreciated a very small canvas of Goya´s entitled La duquesa Alba y su dueña. The playful character of the duchess is shown in her body and cascade of black curly hair. She is scaring her chambermaid (La Beata) with a charm to ward off the evil eye. La Beata represents the old-fashioned and supersticious older generation, who is very scared by this and she wields a cross in her hand. Check it out on Google!! 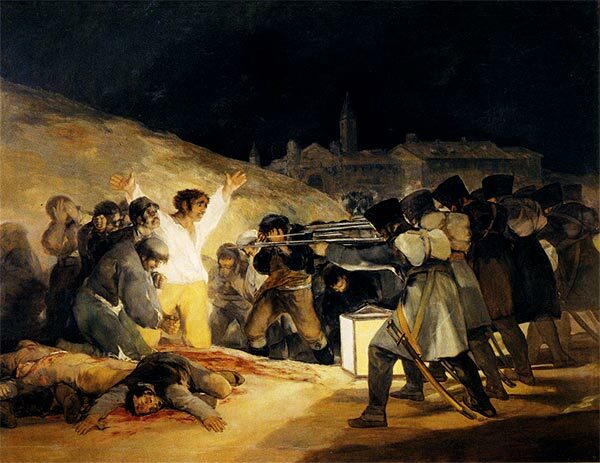 Goya painted a very famous canvas entitled “El tres de mayo de 1808: los fusilamientos de patriotas madrilenos” in 1814, depicting the execution of Spanish peasants by Napoleon´s forces after an uprising in which peasants joined Spanish forces against the French. The French soldiers in the painting have their backs to the scene so you can´t see their faces – they are a line of killing machines. The main figure is a prisoner in a white shirt, his arms in the air, with a look of terror on his face. Around him are others, who show either expressions of despair or fear, and those who have already died lying in their own blood. I had tears in my eyes as I looked at this painting. It is such an indictment of war in general, the reality of the violence of war instead of the glory of battle. It is an incredible experience to view this work. I could go on and on talking about these paintings, but if I have inspired you at all, images of them are available on Google Images, and I suggest you check them out. Since this is so long already, I won´t go into the Bosch paintings, but the most interesting of these were two triptics, one of them being El jardin de las delicias (which inspired Dali) and a table on which he painted in the round the Seven Deadly Sins. Amazing!! We were on our own to return to Barradas after seeing the museum. After all that standing, my feet and my back were aching. KF, Dale and I sat down with our professors for a few minutes before the three of us left, at first with the idea of finding the Metro station to take the metro back, but we couldn´t find it and ended up walking back ALL THE WAY. I thought I couldn’t walk any farther by the time we got to the Gran Via. I insisted we sit down at a sidewalk cafe so I could rest. We ordered coffee which was way overpriced and KF ordered Belgian chocolate which was terrible. Just a block or so after that we found Palazzo, an ice cream place, which was what I wanted in the first place! And we could sit inside where it was cool! We each ordered a dish with two flavors – mine were raspberry and coconut. YUMMMM!!!!! That night when we got back we were hungry but we had the worst dinner we’d had so far at Barradas. Apparently they ran out of food and only had to offer us sandwiches on white bread with cheese and bologna and other types of sliced sausage. No condiments, no nothing!! There was yogurt for dessert, but even that was slim pickings. Since that day, we have had great food, so perhaps that was just because it was Sunday. We’re looking forward tonight to the big game between Spain and Germany! The octopus Paul predicts Spain will win, 1-0. Meanwhile, I have to buy chocolate for Spanish class because we all bet on the game, and I went with the Italian guy in my class, who predicts Spain wins 2-1. Everyone else went with the octopus. This is Spain´s first time in the semifinals!! ROOT FOR SPAIN TO WIN THE WORLD CUP!!!!! !